This once-in-a-lifetime musical event took over Nashville in an epic way and brought some of the biggest names of then-and-now to the stage for a celebration like very few have ever seen before! Titled Loretta Lynn: An All-Star Birthday Celebration Concert, the event was exactly as it sounds – and even better than you could imagine. Featuring some of the biggest names in country music history, the event was to honor a real female pioneer in the genre – and all on her 86th birthday! Dozens of people from the country music community came out to support Loretta during this one-of-a-kind event and plenty of them took time to perform a cover of one of her many hits – including folks like Alan Jackson, Trisha Yearwood, Martina McBride, Miranda Lambert, Tanya Tucker, sister Crystal Gayle, Garth Brooks, Alison Krauss, and Darius Rucker – plus many more! Loretta, who was inducted into the Grand Ole Opry in 1962 has been a staple of the genre for more than 50 years and has always been one to push the limits for what women can sing and how far they can go in their careers. She truly has been a trailblazer and an inspiration to so many. 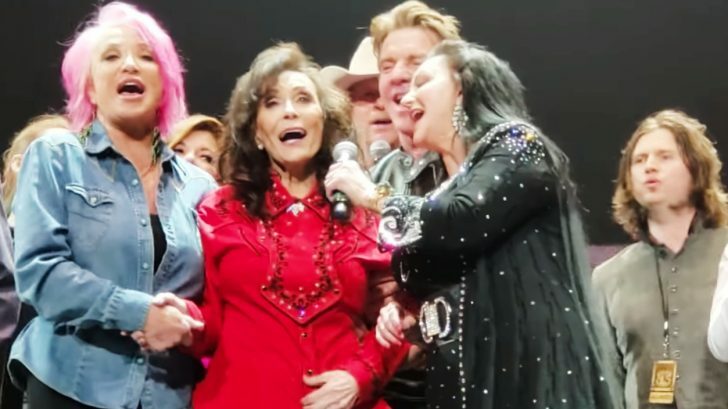 During this truly remarkable celebration for this incredible lady, everyone got together toward the end to sing a group collaboration of her signature song “Coal Miner’s Daughter” and Loretta took her spot right in the center of the stage and sang along with them all! After some recent health battles, it’s so good to see Loretta out and enjoying herself doing what she loves with all of her dear friends around! Check out the full video of the performance below and join us in wishing her the best for this incredible birthday!